Why Use Our Writing Service When Applying for Emergency Medicine Fellowships? Many people looking to be selected for a fellowship in emergency medicine employ the help of our writing service. They recognize that their statement is an essential part of getting them recognized by the selection board. Emergency medicine is one of the newest and most demanding specialty fields. An excellent grounding in medicine, ability to handle a range of patients and conditions, as well as a cool head and great team skills are essential qualities. Personal statements for emergency medicine fellowships or hospice and palliative medicine fellowship personal statement need to get you noticed and show you are a top applicant. Our writing service can help you achieve that. 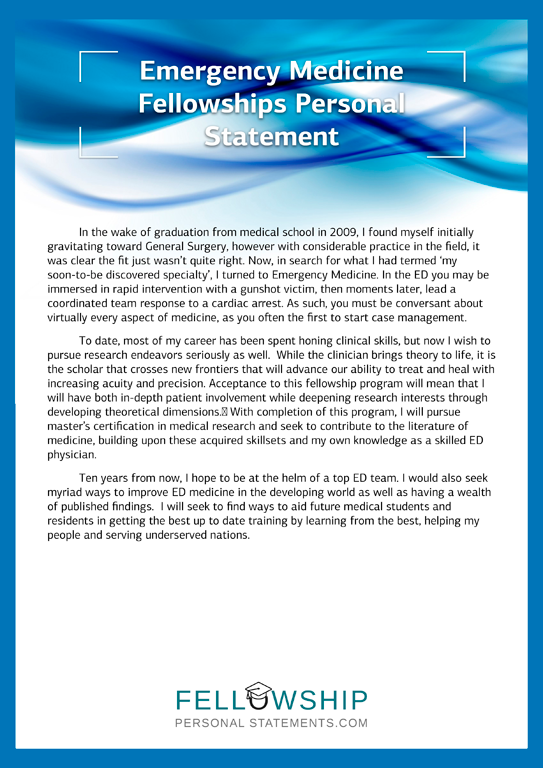 How We Develop Your Emergency Medicine Personal Statement? Our writers are experienced in writing personal statements for emergency medicine fellowships. Working directly with you they ensure your statement reflects not only your skills and experience, but your motivation to undertake a fellowship in emergency medicine, and your plans for the future. 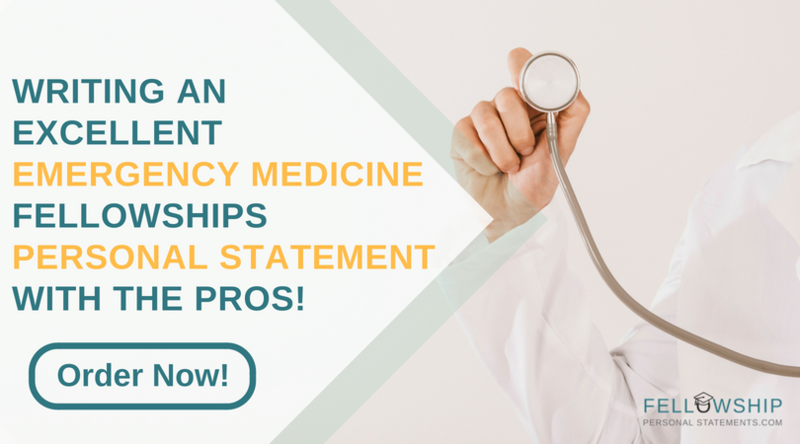 Why you are applying for emergency medicine fellowships or a sub specialty such as a pediatric emergency medicine fellowship? Your career in medicine and particularly emergency care should be covered? Medical fellowships include general medical practice as well as emergency and intensive care training. Your statement should show you have the wide range of skills and motivation required for this demanding post. Reference the fellowship program website and application documents to determine the areas you must emphasize. Emergency medicine fellowships are different depending on factors such as location and hospital type. Our writer will give the fellowship selection board the best impression of why you want to study and work with them. “After medical school I began residency training in internal medicine because it offers many opportunities in areas I am interested in. However those areas that attracted me the most initially are not what I have settled on. I have decided I am best suited for Emergency medicine. Initially I felt that I would feel overwhelmed by the intensity of an emergency room and the never ending action. Instead I found myself thriving in the environment. It isn’t the fast pace or the action that attracts me. I am drawn by the diversity of cases that you experience over just one shift. Emergency medicine requires a good knowledge base in a wide variety of medical specialties as well as strong diagnostic skills. This is what initially drew me to internal medicine and Emergency medicine requires it on a daily basis. In the course of an hour you may see three completely different types of cases that require knowledge from totally different specialties. It is essentially a medical version of a jack of all trades. Once I became aware of my attraction to this area of medicine, I began devoting more time to gaining experience. I realize I have much to learn which is why I am applying to your Emergency Medicine fellowship program. With experienced writers and support staff we believe you will be satisfied with our services. As standard, your personal statement is proof read, checked for plagiarism and delivered before the deadline you set. Unlimited revisions are allowed until you are happy that your statement is going to get you noticed. We have confidence in our service quality such that money back is guaranteed if not fully satisfied. Contact us here today for the very best help with your emergency medicine fellowships applications!